This is almost certainly the best known soap in Britain. It's distinctive aroma is loved by millions, both in Britain and abroad. The scent was created in 1768 by Bayley's of Bond Street who were commissioned by a Russian count to create a scent worthy of the Imperial Court of Russia. In 1938 Cussons created a soap with that very regal scent, originally called "Imperial Russian leather". During the war years, when soap was rationed, Imperial Leather became very popular because of its reputation of lasting longer than regular soaps. Cussons Imperial Leather soap is still made in Manchester, England. You can buy genuine Cussons Imperial Leather soap, imported from England, at Blighty's for a very reasonable $3.99 for a pack of three bars, or buy a case of 36 (12x3) bars for just $42.95 and take advantage of our case discount. What weight are the soaps in this 4 pack? Cussons Imperial Leather comes in 100g bars, so a 4-pack weighs 400g. Is the Bath size still available? Can it be purchased by the carton (12 - 24 bars)? David; re bath size. I can only get the regular (100g) size bars. However, you can now order a case through this website and save 10%. I have looked in various shops trying to find a soap made in the UK but they all now seem to be made abroad. 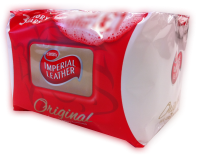 The last pack of Imperial Leather I got was made abroad and it was horrible, not at all like it used to be. I think it was made in China. Blighty's Cussons Imperial Leather soap is the real thing made in Manchester, England. I too have seen cheap knock-offs made elsewhere. The secret is to check the label and the scent.